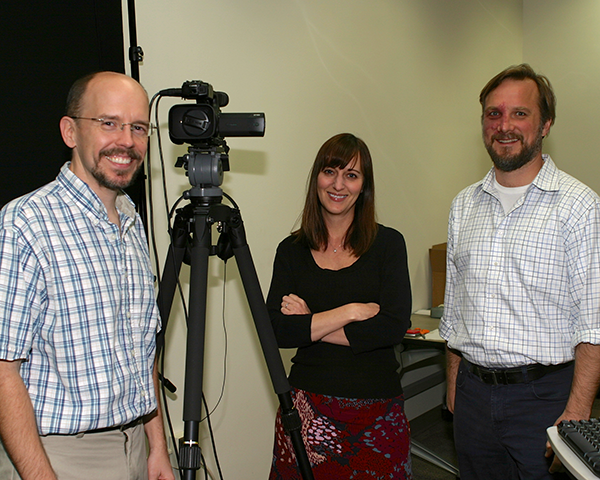 The Academic Technology Services team working on the Coursera online class effort (Steve Bransford, Lee Clontz, Shannon O’Daniel) went live with their first offering on Monday, January 28. The class is called “Introduction to Digital Sound Design,” and is taught by Emory professor of Music Composition, Steve Everett. The four-week class already has 41,000 enrolled students. These kinds of classes are called MOOCs (massively open online class). The Coursera team has three classes queued up and for the next few months they will run in sequence. Next up is a nine-week course regarding the history and politics of AIDS, to be hosted by Kimberly Hagen, of the School of Public Health. Hagen plans to bring in Emory and CDC researchers who were instrumental in studying the disease. This class already has 12,000 enrollees. After that, Polly Price (Emory Law School) is teaching a six-week class on Citizenship and US Immigration: the history and politics of immigration, which the Coursera team is about to begin shooting. The immigration class is up to 11,000 enrollees. Chris Fearrington (ATS) is providing support on the pedagogy of online learning, giving advice on how we test the students, organizing the content and developing best practices. Go to Coursera.org to find our classes as well as those from 32 other universities. Courses typically offer a certificate of completion if tests and assignments are completed on time, but you can also register and watch what you like if you don’t want a certificate. In Steve’s class there are two tests, a midterm and a final. The concept of gaining value from the online courses is still being considered. There are plans to do Verified Certificates, an additional tier of identification of the person doing the work, so that for a small amount of money one can receive a validated certification. They are using biometrics (such as comparing your writing style to previous instances of your writing) to verify that the person is doing the work because of the massive size of the classes. This makes the certificate more meaningful. Another interesting item, the team is creating private copies of the coursework if the instructors building them want to use them with their own students. This way, the class can be cloned specifically for Emory authentication and be taught as a hosted learning management system using the flipped classroom model. This entry was posted in Projects and Processes and tagged Academic Technology Services, Coursera, ECIT, Library, LMS. Bookmark the permalink. Post a comment or leave a trackback: Trackback URL.